We all live in paper towns. Or something. 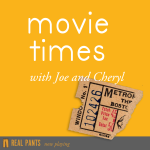 Cheryl and Joe watch the comedy-drama-coming-of-age-mystery Paper Towns and talk YA, marketing to teenagers, manic pixie dream girls, and that time some guys in the park at night gave us free juice in mason jars (last weekend). This movie was Cheryl’s pick. Also, Cheryl eats a bowl of cereal for the first and last time on this podcast.